While we all make brushing a part of our day, too many people forgo flossing. Over the years, dentists have heard every excuse for forsaking the floss, but these people are only hurting themselves because flossing offers so many benefits. Yet by showing the truth to each excuse, perhaps people will see that floss is their friend. Face it, everyone at every age needs to floss every day. Flossing can make a world of difference in your dental care. It can stop decay, prevent disease, and keep your smile clean and healthy. 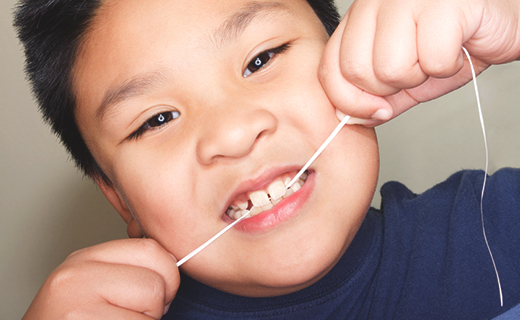 And with National Flossing Day on November 29, that silky strand is in the spotlight. The Truth: According to experts in family dentistry, effective flossing takes three to four minutes, once a day. While it’s better to take your time to get more value from your strand at hand, even 60 seconds of flossing can make a major difference in your dental care. And if you keep your floss near your toothbrush and toothpaste, then you won’t need to spend time searching for it. Then before you know it, flossing will be a regular part of your dental care routine. The Truth: Flossing isn’t easy at first, but practice makes perfect. Start with a long strand of floss and grasp it tightly between your thumbs and forefingers. Gently slide the floss in between teeth and move it up and down along the sides of each tooth. Repeat this process on every tooth with a fresh section of floss.